Amy Stringer-Mowat and Bill Mowat have shared an appreciation for beautiful food, housewares, and inspired engineering since they studied Architecture at Columbia University. Their combined backgrounds in the food industry and woodworking perfectly complement one another in their serveware designs. Today, the couple incorporates the tradition of family and their values into every facet of their work and life together. Wash with mild soap and water. When dry, help condition and preserve your board with mineral oil. See all USA and State Serving Board Measurements. We purchased this cheese board as a hostess gift for family who lives in Iowa. It was the perfect item. The finish is just beautiful! This was a unique gift and a great find. A bit pricey, but worth it! 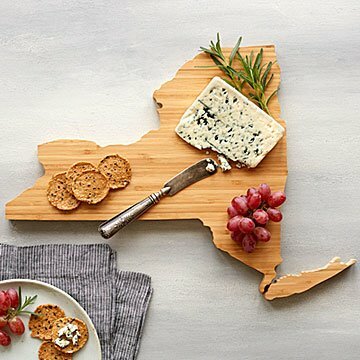 I have several coworkers that recently relocated for this job so I bought them a board shaped like their new home state. Everyone loved the gift! The wood is gorgeous, and the cutting detail is great. I think this is a really nice way to be a bit personalized without being monogrammed or branded. Most people are so proud of their state ..... I know my friends will enjoy this gift! Perfect for entertaining, not to mention, a conversation piece. I bought Vermont for my sister in law. It's so lovely that she might hang it up as art rather than use it as a cheese platter. I might have to get one for myself! The board is hefty, sturdy and a good size too. I might have to get one for myself! This gift was a very big hit! It's a wall hanging in a farm house.